Monte Carlo, in the principality of Monaco, is a popular port of call for many cruise visitors to the Mediterranean. Monte Carlo is small, only three kilometers long (less than two miles) and sits on a large rock named Mont Des Mules, which overlooks the sea. A road separates Monaco from France, and you hardly realize it when you are moving between the two countries. There are about 30,000 residents of Monaco, of which the citizens, called Monegasques, make up about 25 percent of the total populace. Many people think Monte Carlo and Monaco were synonymous, especially since the country is so small. There are several areas in Monaco. The old town of Monaco-Ville surrounds the palace on the southwest side of the Monaco harbor. To the west of Monaco-Ville is the new suburb, harbor, and marina of Fontvieille. On the other side of the rock is La Condamine. The resort of Larvotto, with its imported sandy beaches, is on the east, and Monte Carlo is in the middle. The history of the ruling Grimaldi family dates back centuries. Port of Monaco is first mentioned in the records back in 43 BC when Caesar concentrated his fleet there while waiting in vain for Pompey. In the 12th century, Genoa was granted sovereignty of the entire coastline from Porto Venere to Monaco. After years of struggle, the Grimaldis captured the rock in 1295, but they had to continually defend it from the surrounding warring factions. In 1506 the Monegasques, under Luciano Grimaldi, withstood a four-month-long siege by a Genoan army ten times their size. Although Monaco officially received full autonomy in 1524, it struggled to remain independent and, at times, was under the influence of Spain, Sardinia, and France. It is currently run as a sovereign principality. The relationship between Monaco and France is interesting. Any new law passed in France is automatically sent to Prince Albert, the current head of the Grimaldi family and the titular ruler of Monaco. If he likes it, it becomes a law in Monaco. If not, it doesn't. The view coming into the sheltered harbor is spectacular. Because of the limited space, some buildings are constructed over the water. The streets of the city practically ooze money. Expensive cars and limousines are everywhere. 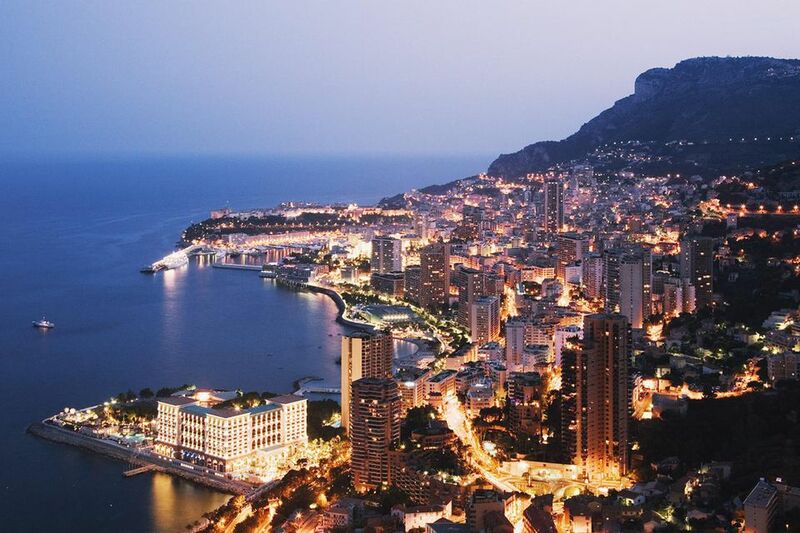 Monte Carlo is a place where the rich and famous journey to see and to be seen. Gambling and tourism have been the primary livelihood of the city for more than a century. If you're not a gambler, don't let that keep you from traveling to Monaco. However, even with only one day in port, there are other interesting shore activities, as well. It is easy to navigate Monte Carlo and Monaco if you take time to learn the shortcuts. The cruise director or shore excursion desk will have city maps that highlight the tunnels, elevators, and escalators that facilitate touring the city. Grab one before you go ashore. If you walk to the western side of the harbor, an elevator will take you up to Monaco-Ville and deposit you near the Musee Oceanographie (Oceanographic Museum). This is a must see if you have the time. Explorer Jacques Cousteau was the director of the museum for over 30 years, and it has a wonderful aquarium with both tropical and Mediterranean species of marine life. As you continue walking along the Avenue Saint-Martin, look out for beautiful cliff-side gardens, and visit the Monaco Cathedral. This cathedral was built in the late 19th century and was where Princess Grace and Prince Ranier married. Also, it is where Grace, and many of the other Grimaldis, are buried. The Palais du Prince (Prince's Palace) is located in old Monaco-Ville. The Grimaldi family has ruled from the palace since 1297. If the flag is flying over the palace, you know the Prince is in residence. The Grimaldi children each have their own separate homes in Monaco. The changing of the guard takes place daily at 11:55 am. There are guided tours of the palace each day. If you leave the harbor and walk to the east, you'll find the famous Casino De Paris (Grand Casino). It's only a short walk, elevator, and escalator ride away. If you plan on visiting the Grand Casino, you'll need your passport to enter. Monegasques are not allowed to gamble in their own casinos, and passports are checked. There are very strict dress codes in the Grand Casino. Men need to wear coat and tie, and tennis shoes are verboten. The Casino was designed by Charles Garnier, the architect of the Paris Opera House. Even if you're not a gambler, you should go in to see the beautiful frescoes and bas-reliefs. Many can be seen from the lobby of the casino, without having to pay the entrance fee. The gaming rooms are spectacular, with stained-glass, paintings, and sculptures everywhere. There are two more Americanized casinos in Monte Carlo. Neither of these has an admission fee, and the dress code is more casual. Check out the prices of the hotels and restaurants in Monaco, and you'll be glad you are on a cruise ship. The Hotel de Paris, near the Grand Casino, has elegant restaurants. You might run into some celebrities if you dine in the Louis XV Restaurant or Le Grill de L'Hotel de Paris there. If you feel the urge to mingle, the Cafe de Paris is a good place to stop and sip a late night aperitif. You can watch the action and the people going in and out of the Casino. Shopping in Monte Carlo is not as different and special as it was years ago. Many of the designers now have shops in the United States. There is a concentration of top names in fashion in Monaco, as you would expect, given the expensive lifestyle. From the Avenue des Beaux-Arts, between the Place du Casino and the Square Beaumarchais, is one area. Another is under the Hotel Metropole. Most people will enjoy wandering the area and window shopping, even if you don't buy anything. After you've explored Monaco, the countryside surrounding Monte Carlo on the Cote d'Azur is gorgeous. If you can tear yourself away from the glitz and glamour of Monte Carlo, take time to see towns and villages on the French or Italian Riviera, like Eze.